Home » News archive » DEMON HEAD:…d." DEMON HEAD: Announce New Album "Hellfire Ocean Void." 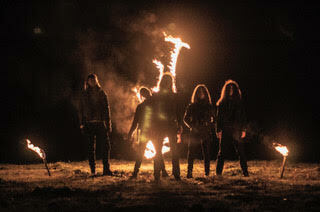 Denmark’s Demon Head have signed to Svart Records for the release of their new album ‘Hellfire Ocean Void’ which is out on 22nd Feb. They’ve also shared a new video for the track ’The Night is Yours’ which captures their retro sound and is described by the band as 'a song for hungry souls’. Demon Head's 'Hellfire Ocean Void' is composed by 8 songs that unfolds themselves effortlessly perfect in the tension between a delicate sense of composition and the uncompromising urgency with which the five musicians deliver the performance of each song. Mournful melodies of unearthly dimensions is played on piano and orchestrated with the use of the classical rock instrumentation; electric guitars, bass and drums. Dark and mystical chord progressions, sporadic guitar solos, chaotic arpeggio synthesizers and the prophetic words of M.F.L are hold together by the solid drum beats of J.W. Ambient recordings of acoustic instruments are accompanied by tape manipulation, that slowly develops into a haunting soundspace, that shows B.G.N skills as an avantgarde composer. Guitar leads morphs into the breathtaking improvisations of T.G.N as the bands energetic center of bassist M.F leaves nothing to be questioned. The writing, recording, mixing and production was all done during the winter 2017-2018 by Demon Head in their own analog studio. Isolating themselves in the frozen country side by the cost of Denmark and having no studio time limitations made it possible to encounter the recording studio as 6th member, enabled them to produce the album with sincere curiosity and perfection. The only other person involved was the legendary producer Flemming Rasmussen (Metallica, Morbid Angel, Mercyful fate, etc.) who mastered the album in Sweet Silence Studios. With 'Hellfire Ocean Void' released on 22nd Feb via Svart Records, Demon Head have created a masterpiece in contemporary rock music. As any other truly original music, it is difficult to draw any similarities, since the music seem to hint at nothing but it owns integrity. An integrity that is based upon the insight that Demon Head gains from loving and accepting the many clichés and traditions that follows playing rock music - and from that foundation moves far into the unknown, into the darkness and into our hearts.